(Jessica Hill | The Associated Press) In this Aug. 17, 2018 file photo, family and friends who have lost loved ones to OxyContin and opioid overdoses leave pill bottles in protest outside the headquarters of Purdue Pharma, which is owned by the Sackler family, in Stamford, Conn. 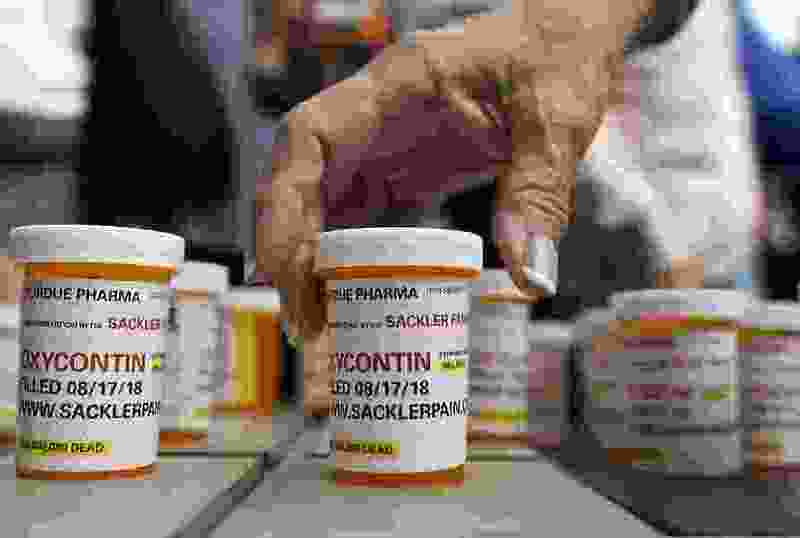 The company that has made billions selling the prescription painkiller OxyContin says it is considering bankruptcy as one of several possible legal options, in an email to The Associated Press. Purdue Pharma and the state of Oklahoma have agreed to settle a lawsuit over the drugmaker’s role in the deadly opioid crisis, a milestone in the legal effort to force pharmaceutical companies to pay some of the costs of the epidemic, people familiar with the matter said. The deal, which is scheduled to be announced at a news conference Tuesday, will require Purdue and the family that owns the company to pay approximately $270 million. Most of the money will fund a new center for research, education and treatment of addiction and pain at Oklahoma State University in Tulsa. Oklahoma is free to continue its lawsuit against two other defendants and their subsidiaries — Johnson & Johnson, the 37th-largest company in the United States, and Teva Pharmaceutical Industries, an Israel-based manufacturer that focuses mainly on generic drugs. The two companies, which have asked to be tried separately from Purdue, are slated to go to trial on May 28. Lawyers in the case and a spokesman for Purdue declined to comment ahead of the planned announcement Tuesday. Oklahoma contends that Purdue, Johnson & Johnson and Teva bear some responsibility for thousands of opioid deaths across the state, in addition to the health care, law enforcement and treatment costs of the state’s addiction crisis. Purdue and others face similar claims in several other courts, and the first major settlement in the flood of lawsuits could help set the bar for compensation sought by hundreds of states, cities, counties and Native American tribes for the costs incurred in responding to the epidemic. About 1,600 of those cases are consolidated in one enormous case — known as multidistrict litigation — before a federal judge in Cleveland. That action targets companies that manufactured, distributed and dispensed narcotic painkillers across the country, and those cities, towns and tribes are seeking damages in what some believe is the most complex litigation in U.S. history. Thirty-six states — including Utah — have chosen to bring separate lawsuits in their own court systems, believing they have better chances there. Purdue’s recent acknowledgment that it is considering bankruptcy as an option could influence strategy in those lawsuits; Oklahoma’s settlement ensures it will receive at least some compensation for its claims. Under the terms of the settlement, Purdue will contribute $102.5 million to establish the new addiction center, and members of the Sackler family, who own the company, will pay another $75 million in personal funds over five years, people familiar with the agreement said. Purdue also will provide $20 million worth of treatment drugs, will pay $12 million to cities and towns, and will cover about $60 million in pay to private attorneys from two law firms that have represented Oklahoma in the case. The addiction center would be housed at Oklahoma State University's Center for Wellness and Recovery and would be overseen by an independent board. Nearly 400,000 people in the United States died of opioid overdoses between 1999 and 2017, according to the Centers for Disease Control and Prevention, including a record 47,600 in 2017. Purdue is widely blamed for helping to start the epidemic after it introduced the powerful opioid OxyContin to the market in 1996. The company allegedly persuaded doctors to prescribe — and overprescribe — the drug for a wide variety of ailments. In 2007, Purdue and three of its executives pleaded guilty to misconduct in their marketing of OxyContin and paid more $600 million in fines. Authorities have argued that Purdue used deceptive marketing tactics and a sizable workforce of representatives to repeatedly visit physicians to sell them narcotics, assuring them that the drugs were rarely addictive. Many patients became addicted to the potent painkillers, and large amounts of the drug were diverted to the black market. More than 2 million Americans now suffer from an opioid use disorder, according to government data. The epidemic has evolved to encompass illicit use of fentanyl, a synthetic ultrapowerful opioid that has caused a spike in overdoses and fatalities. Three years ago, the CDC estimated the cost of the opioid epidemic at $78.5 billion for calendar year 2013. In 2017, the White House Council of Economic Advisers placed the price tag much higher, at $504 billion for 2015. A consultant's report that Oklahoma filed in court estimated that abating the opioid crisis in that state would cost more than $8.7 billion during the next 20 years. Oklahoma Attorney General Mike Hunter sued the three drug companies in June 2017, and the two sides have been taking depositions and jousting over pretrial issues for nearly two years. As other cases lagged, Oklahoma judge Thad H. Balkman set a May 28 trial date, agreed to televise the proceedings live and refused drug company requests to postpone the trial. That ensured that the Oklahoma case would be the first major test of whether the companies would be forced to pay for the crisis. According to a lawsuit filed by the state of Massachusetts, Sackler family members received nearly $4.3 billion in payouts from Purdue between 2008 and 2016. But the family-owned company has suffered heavy blows to its image in recent months as litigation has advanced. Three museums in Britain and the United States have turned down donations from the Sacklers, longtime patrons of the arts, in recent days. And documents released in the Massachusetts lawsuit, brought by state Attorney General Maura Healey, depicted some of the Sacklers as insatiably greedy and uncaring about the human toll of their product.